I am seduced by humidity this summer, thriving in it like a tropical plant. The wild vines of suburbia transport me to dream landscapes, the geographical coordinates of which are noted above the round doorways of these reliquaries. The viewer peers inside to see 35mm slides of three paintings by Henri Rousseau: The Dream, Struggle between a Buffalo and a Tiger, and Tropical Forest with Monkeys. 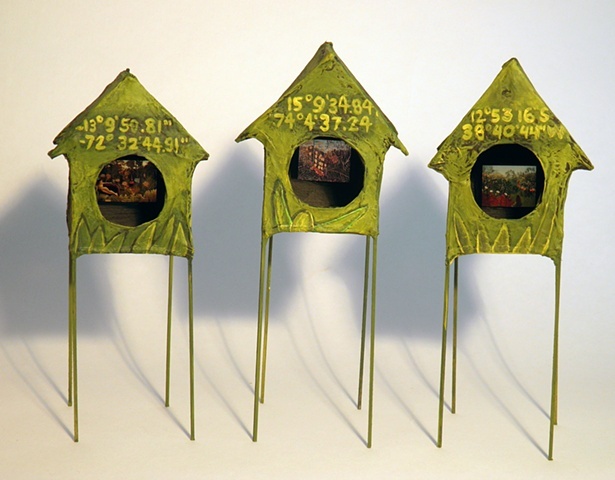 The birdhouse forms imply avian life taking residence in these temporal spaces. In this work I explore the dichotomies of nesting and flying, domesticated and wild, and reality and fantasy.